University Sports Board and Department of Physical Education are existing since the inception of Kakatiya University i.e., in 1976. Kakatiya University has started functioning from the academic year 1976-77 with 18 colleges in Warangal City limits. In the year 1987-88, the jurisdiction of the University has been extended to the colleges of four (4) districts in North Telangana Region i.e., Warangal, Khammam, Karimnagar and Adilabad. Now, there are nearly 500 colleges under its jurisdiction including Engineering, Pharmaceutical, Education, Physical Education, M.B.A, M.C.A etc. The University Sports Board and Department of Physical Education has been giving top priority to the games and sports activities. The sports activates are encouraged for comprehensive development of student's personality which include physical fitness, intelligence quotient levels, character, endurance, mental abilities, time management skill, punctuality and overall discipline which students need in their routine. The Sports Board and Department of Physical Education was headed by Sri. K.R.V.Krishna Rao, Sri. N.A.Jaichander, Sri.Puli Ramchander, Prof. N.Lingamurthy, Prof. Erragattu Swamy, Prof. Ch. Sammaiah, Prof. David, Prof. B.Venkataratnam, Prof. D.Sakriya and Prof. B.Digamber Rao. Presently, University Sports Board and Department of Physical Education in the hands of Dr. Gade Pani, Assistant Professor. Many sportsmen and sports women have won many teams and individual events in various games & sports including National, State and All India Inter University competitions every year and brought many laurels to the University Sports Board and Department. The university has provided an area of 45 acres of land for play fields with standard specification for games & sports like Athletics track and field, Football, Hockey, Cricket (4), Handball(2), Volleyball(2), Badminton(3), Ball Badminton, Basketball, Kabaddi(2), Kho-Kho(2), Table Tennis(2), Tennis, Gymnastic hall, Multy Gym with weight lifting facility. The college and University Sports Board have been spending huge amounts. Every year sending the teams for Inter collegiate and Inter University Tournaments year after year the performance increasing vertically and also increasing men and women teams. Since inception of the University, the university sports Board has been sponsoring various teams in All India / South Zone Inter University tournaments organized by various Universities of India. Year after year the university has been providing and improving infrastructural facilities and every year our university has been sponsoring 38 teams in 24 disciplines in the above said University National tournaments. Apart from the participation in All India University Tournaments, the University is also conduction Inter - Collegiate Tournaments every year for all the constituent and affiliated colleges in almost all the games and sports events. Considering the above, U.G.C has sanctioned Rs. 35 lakh under VII plan period for construction of Indoor Stadium with Wooden floor. The construction has been completed 1996. Our university has conducted South Zone Inter University Volleyball Tournament for men in the said Indoor Stadium under flood lights. The University campus is also being used by the District Associations for conduction State Level and National level tournaments in general and Athletics, Handball Football, and Badminton in particular. Several such events are regular feature of the campus. The events are attraction the number of students and spectators since the campus is centrally located in the Municipal Corporation limits of Warangal city. The University is trying to provide the facilities in almost all the games and sports. 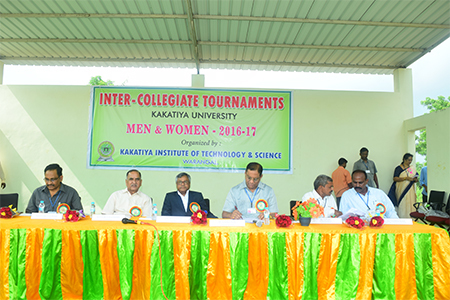 Kakatiya University, Warangal has attained importance in Telangana state to organize All India level and Inter collegiate tournaments. Every year "Annual Sports Day" celebrations will be held in the month of April. The performance of our University sportsmen in Inter University level was exemplary. They brought many laurel to the university at National and International level. To develop positive personality traits, discipline, self control, hard work, emotional stability and physically, mentally and mould the students behavior socially acceptable. To develop healthy habits and good hobbies and to promote friendship among the students inter personal relationship, sociability, mobility and positive thinking and utilize the leisure time. To encourage competitive spirit, Dynamism and adaptability to meet the challenges of life. To make every student to realize his/her innate power, skills, energy and strengthen moral turpitude. To develop the various organic system of the body, so that they respond in a healthful way to increase demand placed on them. The Vice-chancellor will nominate the committee with Registrar, Physical Educational Personals and Principals. Recurring special fee under Games & Sports head is collected at the rate of Rs. 60/- per student for every year. Rs. 3 Lacks, to purchase material and maintenance of the play field. Recurring special fee is collected at the rate of 60/- per student from all the constituent and all affiliated colleges under the jurisdiction of Kakatiya University, Warangal. It is around @ Rs. 75 lakh for year. The college and Sports Board has an area of ------------acres of land for play fields. University Sports Board is organizing the Inter collegiate tournaments every year in three phases, i.e., Men two phases and women. Sports Board is conducting Coaching camps for a period of 15 days in each game/sport and also providing Track suit, Kit, T.A and D.A (Coaching camp and tournament) to participating players at All India / South Zone Inter Universitychampionships organized by various universities of India. The University sports Board is also giving incentives to the medal winners @ Rs. 6,000 /- for Gold, Rs. 4000/- for silver, Rs. 3000/- and Rs. 1000/- for IV th Place. Total 374 players have taken part in Inter University Tournaments consisting of 38 teams in 24 disciplines sponsored by University Sports Board, Kakatiya University, Warangal about 20 lakhs budget is allotted. Regular practice for the students of the departments. Conduct selections for college teams. Sending the college teams in various games and sports for Inter Collegiate Tournaments for every academic year. Sending top players for Inter University tournaments. Conduction Intramural competitions for all the students of our college. Conduct Annual sports Day celebrations in month of April. The Kakatiya University with its meager infrastructure us doing extremely well at University Nationals, National and State level tournaments. Sports persons from our University has won lot of medals and brought laurels to our University. Keeping in view the importance that is being given to the games and world over, it is time now to develop more infrastructures and keep more facilities open to the students' community in order to attract the young budding athletes.